Hi Friends: Today's post is a Halloween tag. Since the spooky season is fast approaching, I thought it was a great theme for the techniques I'm using. Please see below for photos, process, challenges, and supplies. Have a super day! 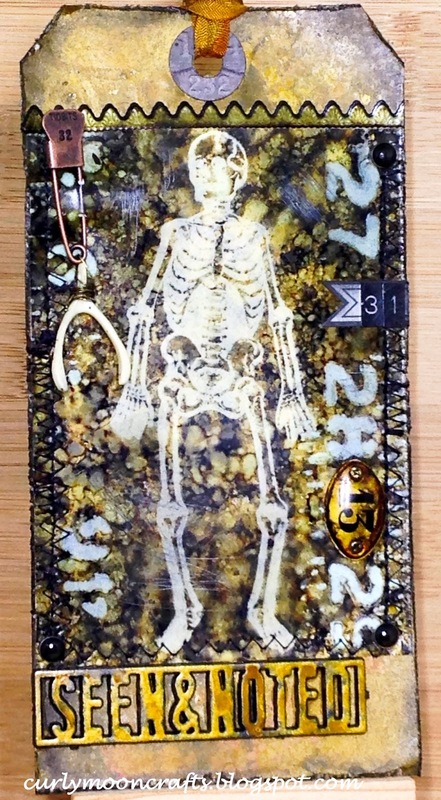 This tag uses the 2 techniques in the Tim Holtz September 2016 tag: Distress Patina and Alcohol Ink Resist. 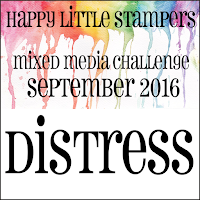 As in the tag post, it also uses the distress ink stamp resist on yupo. I started with a blank tag and used Distress Paints to create the Distress Patina effect. I also used the technique on the Alpha Part used on the tag. I used Distress Inks to add some shading and did some water splatters to the background. Next, I got out my yupo and played with my Alcohol Inks. I colored the background with inks and let them get all marbly - love it! Then I used the skeleton stamp from the Retro Halloween set, inked it with 2 colors of Archival inks, stamped on top of the alcohol inked yupo, then wiped the stamp clear to show the resist. Cool! I used the Measured Layering Stencil with alcohol Blending Solution to create the resist technique. Once done, I used my sewing machine to stitch the yupo to my tag. Then I embellished with Index Labels, Reinforcers (edged with Black Soot), Label Letters, Wishbones, a Mini Plaquette and Gallery Industrious stickers (both inked with the same Alcohol Inks), the inked Alpha Part, a Trinket Pin and some black brads. To attach the wishbone to the trinket pin, I wrapped it with some silver wire that I inked with the Alcohol Inks. I used some Distress Stains to dye the ribbon and added it to the tag. I wanted the tag to look a bit more tattered and worn, so I distressed the edges with my distress tool and added some scratches to the yupo. I finished with more Black Soot ink around the edges. Note: I deliberately used the numbers in the stencil, Plaquette, and Trinket Pin to get at the "spooky" 13 & 31 dates. This was lots of fun to create - I got to use some of my alcohol inks, which I love, and try some new techniques! LOVE that you used the skeleton! Awesome take! Oooh this guy is reaaaly distressed!!! love the techniques!! What a fabulous spooky tag and you used some great techniques! 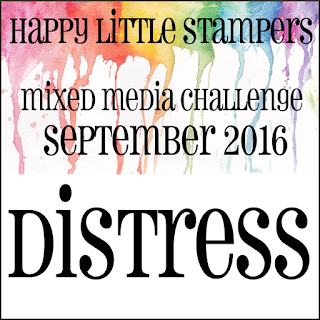 Thanks for sharing with us at Happy Little Stampers, and I hope you will join us again soon. Love this tag!! Your background is awesome! Congrats on your win! Great job on the Tim techniques! Love your colors and choice of stamp and embellies! Huge congratulations on your well deserved win at Tim's! Whoa... this spooky good! Congrats on your win! Congrats! I can't wait to see your October tag. This is just fabulous.